Control units can be designed as limit rods or tie rods depending on the application. Their designs are based on the calculated thrust force of the rubber expansion joint at the specified pressure and can be attached to the external or internal hardware of the expansion joint. 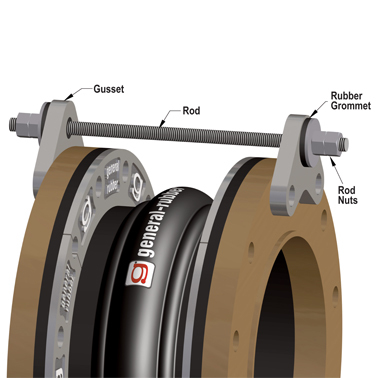 The arrangement can also include a combination of rubber grommets, flat or spherical washers, as well as internal limits for specific applications. The standard gusset plates are high-grade carbon steel with a hot dip galvanized finish, and the standard rods are high tensile steel with a hot dip galvanized finish. Stainless steel control units are also readily available, as are those made of alternative materials including, but not limited to, aluminum, bronze, and Teflon-coated hardware. Limit Rods are control units designed with a gap to allow the rubber expansion joint's movement range (axial, angular, lateral, and torsional) during normal operation. In the event of main anchor failure, the limits rods will engage and function as a secondary restraint. This will prevent the rubber expansion joints from over-extension or over-compression, by restraining the full pressure thrust loads. Tie Rods are control units designed to continuously restrain expansion joints axially while also restricting their other movements (angular, lateral and torsional) during normal operation. The tie rods will act as the primary restraint by continuously restraining the full pressure thrust loads. General Rubber is proud to detail many of these styles on the linked control unit data sheet as well as illustrating them on the expansion joint data sheets.